Rhyme scheme reminds me of Dr. Seuss. Would be good for a bear or camping storytime, especially if you ask the kids to help you scare him away at the end! How do you scare a bear? Five friends explore many possibilities (some very silly) but in the end the answer is quite simple. Delightful illustrations and the outrageous antics of bear and kids will make preschoolers giggle. This is a really fun book! The rhyming also makes it simple yet fun to read. It's a great way to introduce rhyming and also a great book to have a discussion with. Students could brain storm their own ways to scare a bear. The illustrations are great and full of detail. This book has lots of fun illustrations; I especially like the pages with something (or someone-like a bear hiding or sneaking or peeking!) in the background. The text is superb for rhyming and has a great read aloud rhythm. I really like this book. It is a great text for young children to listen for rhyming words. I also have to point out that this book contains a lot of questions which would also be helpful in teaching young children about punctuation. My 5-year-old enjoyed this book. It basically just asks a lot of questions about a bear and what would you do in certain situations. It was a good book to talk about why you would or would not make a certain decision. Tremendous humorous & reparative refrains makes this a great choice for preschool storytimes. Cute, rhyming book with an outdoors/camping theme.Veg*n families note: There is a scene of the bear and boy fishing from a boat. With lots of rhyming and silly situations, this would make a terrific read-aloud for story time. goes on a bit too long with the refrain but still cute esp for fans of bear picture books and rhyme. 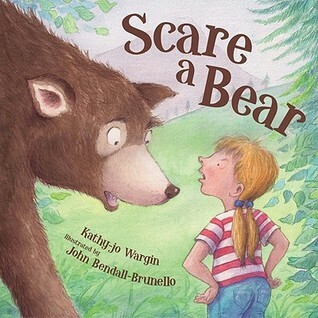 Sing-song rhyming title about how to scare a bear *who doesn't scare*...preschoolers will enjoy the adventure with the fun ending! I think this is a fun book and a fun concept for young readers. How would you scare a bear? Also the rhythm of the book is great! Super cute. Humorous ways of how kids deal with scaring off a bear at camp. Cute rhyming story about how you would scare a bear if it came to your summer camp. I definitely want to use this for a camping-themed storytime. A fun, rhyming read. Almost all the text consists of questions to the reader, so beware in a storytime, you might get overwhelmed with responses. This would be fun for one on one reading, however. A rhyming advice on how to scare a bear, even a persistent one! Kathy-jo Wargin John Bendall-Brunello - Kathy-jo Wargin is the bestselling author of more than fifty books for adults and children. With more than 1.2 million copies sold, she writes across genres and age-groups, and has earned national recognition for award–winning titles such as Michigan’s Official State Children’s Book The Legend of Sleeping Bear, the International Reading Association’s Children's Choice Award Winner The Legend of the Loon, the Bank Street College of Education Best Book Listee The Voyageur’s Paddle, the IRA Teacher's Choice Award Winner Win One for the Gipper, and many more. Her Orchard Bay series for adults takes place in a fictional town nestled in the lovely Door Peninsula of Wisconsin.